The White Outdoor Snow Blower 12533LSW clears a wide swath of snow with its 33 inch width augers and the tool-less snow drift cutters. At 357 cc’s it has the power to clear the snow from your driveway no matter how big the snow drifts are. The 16 inch augers and the 16 inch impeller provide the two stage action to blow all of the snow well away from your driveway or sidewalk. Combined with a 6 speed transmission, you can set the speed that is comfortable for walking behind as well as for the snow load that you are experiencing. Operators can select high speed for transport between locations or between driveways if you are doing more than one. You can also gear down to 1st gear for particularly heavy loads or deep snow that takes a bit more power to chew up and blow away. The tires are 16 inches by 6.5 inches and when combined with chains will have the traction to move around on ice and snow with no traction issues at all. Heavier machines can be more difficult to maneuver, so you will want to take advantage of the steerable wheel drive feature that provides effortless turning capability. This White Outdoor Snow Blower 12533LSW comes with a number of features that make this snow thrower a pleasure to use even in difficult or deep snow conditions. From tool less drift cutters, to heavy duty skid shoes and a heavy duty large frame, this snow thrower will make the difference for you when blowing snow. The heavy duty skid shoes can be adjusted to the conditions you have in your yard, Set them higher if you are blowing snow on gravel. Operators will also appreciate the dual halogen lights which are great for night time snow clearing. When it comes time to store the White Outdoor Snow Blower 12533LSW, the handles fold to allow you to fit the snow blower into tighter spaces. There are two accessories that will be interesting to operators. The snow cab protects you from the wind and blowing snow. Clear vinyl fitting over the handles protects the upper body and keeps the snow and wind from your head and chest area. Add the snow thrower cover to protect your snow thrower in the winter as well as the summer time. Keeping the snow thrower protected from the elements will prolong the life of this unit. This White Outdoor Snow Blowers 12533LSW can be purchased at a number of dealers across Canada and the northern US. Dealers include Lowes and Rona as well as a number of independent dealers. Delivery can be arranged for a price or can be negotiated as part of the price of the snow thrower. Of course, it is cheaper if you can use your own trailer to pick up the White Outdoor Snow Blowers 12533LSW at the local store. Snow cab – excellent for blowing snow in windy weather were you need protection from the wind and the snow that gets blown back at you. Fits on to the handles to protect the upper body on three sides. Snow Thrower Cover – if you cannot store your White Outdoor Snow Blowers 12533LSW inside, why not consider the snow thrower cover accessory to protect your investment. Protects your snow blower form the elements all year long. Online Reviews: We did not see any reviews on the company’s web site. Feel free to add yours to this post to help other consumers in Canada and the US. This is one of the areas that many people do not pay much attention to. Yet these are dangerous machines when in the hands of careless operators. Always shut the machine off if it is left unattended or if you need to do any maintenance or clear the augers of ice or snow to avoid hands and arms getting caught . Wear tight fitting clothes and do not wear long hanging scarves when operating the White Outdoor Snow Blower 12533LSW. Snow can be blown a good distance and pieces of ice or small stones will go even further. Always point the chute away from people, buildings or cars. You want to avoid accidental damage to persons or objects in the path of the blown snow. Consumers will also appreciate that the White Outdoor Snow Blower 12533LSW should not be operated at a high rate of speed in conditions were you can hit a car or some other object. Finally make sure you review all of the manual prior to operating for the first time. Always check the oil in the engine and top up as required prior to starting. 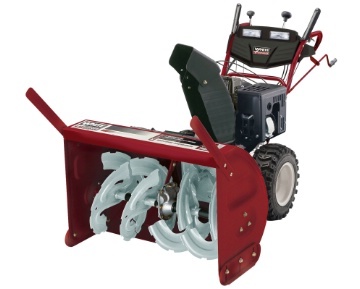 The White Outdoor Snow Blower 12533LSW should be kept covered at all times to avoid weathering and deterioration. Change the oil on a regular basis following the directions in the manual. Change the oil at least once per year or more often depending on usage of the snow thrower. Heavy users of the snow thrower may need to change the oil in the engine once per month or even more often. Always shut the engine off prior to doing any inspection or maintenance of the White Outdoor Snow Blower 12533LSW. The White Outdoor Snow Thrower model H9575 has the power and the width of cut to make short work of any snow drift you can throw at it. 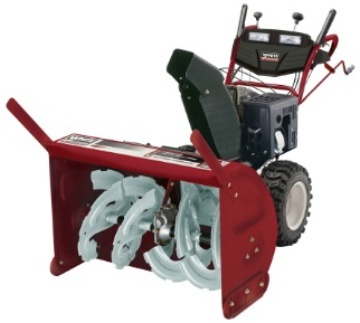 All of the features included on this snow thrower are designed with the home owner in mind. From the folding handles to the head lights, this machine has what you need. If you need to store the White Outdoor Snow Thrower H9575 outside, there is an optional snow cover that will protect your investment from the elements winter and summer. If you receive a lot of snow and have windy days why not consider the optional snow cab that provides three way protection from the wind and the blowing snow. It is amazing how much difference a snow cab can make to your overall comfort when blowing snow with any snow blower including the White Outdoor Snow Thrower H9575. Features such as electric start and trigger control allows you to start the snow thrower with the press of a button and steer with the press of a trigger. No need to try to man handle this snow blower, anyone can drive this powerful snow thrower while clearing your driveway and sidewalks. The White Outdoor snow thrower H9575 is ready to go with oil already in the engine. All you need to do is add fuel and you are ready to go. White Outdoor has thought just about everything you will need. We have already mentioned the snow cab and the snow cover, extra shear bolts, electric start and trigger steering. Add folding handles to allow storage in tight places, headlights for nighttime operation and poly chutes that do not rust and do not break from the cold. The White Outdoor snow thrower H9575 is a snow thrower that will satisfy even the most tough environments. Cut through high snow banks and blow the snow far away from your driveway. Delivery : The White Outdoor Snow Thrower H9575 can be purchased in Canada at any of the RONA and Reno Depot hardware and lumber stores . Customers can see these snow blowers along with other models at any of these stores and can also arrange for pickup or delivery. Snow Cover – If you need to leave your White Outdoor Snow Thrower H9575 outside instead of storing it inside your garage, the snow cover provides great weather protection and off season storage. Made of rip stop woven polyethylene technology, that has been UV treated and comes with a drawstring to keep it securely in place. Read the manual and follow all of the safety and operating guidelines that are outlined in the manual. Before you operate the White Outdoor snow thrower H9575 each time always check the oil in the engine to make sure that it is at the appropriate level. Top up as required. Fill the fuel tank as well to ensure that you will not run out of fuel while blowing snow. Always do a quick check of all parts of the snow thrower to confirm that there are no loose parts. Check for broken shear bolts and ice frozen around the augers or the impeller. Break away this ice prior to starting the snow thrower. Repair anything that needs repair prior to stating the snow thrower. When you complete snow blowing for the day and prior to storage, always clean all loose snow and ice off of the machine. This avoids melting snow and salt gradually corroding the frame of the snow blower over time. Cover the snow thrower or store inside after use. When you are blowing snow, point the chute away from people, cars and homes. Ice pellets can hurt and damage surfaces when they are flung out of the snow blowers chute with projectile like force. Maintenance of the White Outdoor snow thrower H9575 is straight forward. Keep it clean and dry between uses. Change the oil at the recommended intervals outlined in the manual. Or at least once per season to protect the engine from dirt and grime build up in the old engine oil. Check the tires to make sure they are always properly inflated. Check the shear bolts to make sure they are always in place. Lubricate all areas as outlined in the manual. If you need to have major work completed on your snow blower, arrange for a pickup and repair at a local small engine repair shop. Most people can perform basic maintenance on their snow blowers. However you may want to talk to an expert first to determine what is involved.